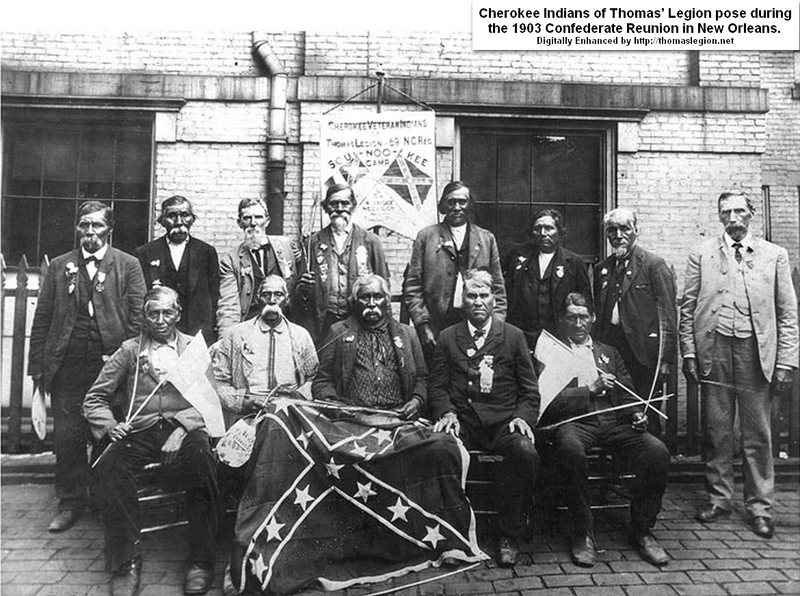 Thomas’ Legion, or Thomas' Legion of Indians and Highlanders, was the largest single military unit organized in North Carolina during the American Civil War (1861-1865). This legion, which would initially field some 2,500 soldiers, consisted of an entire command of infantry, cavalry, and artillery, and was sometimes referred to as Love's Regiment or the Sixty-ninth North Carolina Infantry Regiment (though not found or recorded on any official document). Thomas' Legion (aka 69th North Carolina Regiment) should not be confused with the 69th North Carolina Regiment-7th Cavalry (aka 69th North Carolina Cavalry Regiment or 69th North Carolina State Troops), which was initially known as the 14th North Carolina Cavalry Battalion before being enlarged to a cavalry regiment. Although attributed to grammar, the Thomas Legion organization was officially designated and recorded as Thomas' Legion (or Thomas' Legion of Indians and Highlanders) and not Thomas's Legion, so while researching this unit, the different designations will assist the student. Unlike the Civil War regiment with its 1100 soldiers, the legion was a much larger and more comprehensive fighting force and resembled a brigade. On February 20, 1863, while at Strawberry Plains, Thomas' Legion recorded "2556 Aggregate Present and Absent." (Official Records of the Union and Confederate Armies, Series 1, Volume 23, part 2, p. 644). The unit's two thousand five hundred officers and men, including 400 Cherokees, were distributed in infantry, cavalry, and artillery. Its artillery battery, John T. Levi's Light Artillery Battery (aka Louisiana Tigers or Barr's Battery), formerly served in the Virginia State Line Artillery before being added to the Thomas Legion on April 1, 1863. Although it was an independent command, the Thomas Legion would initially report directly to Brigadier General Henry Heth prior to the exigencies of war requiring its regiment to be detached and moved into the Shenandoah Valley in May of 1864. (O.R., 1, Vol. 16, pt. II, p. 985, O.R., 1, Vol. 20, pt. II, p. 466, O.R., 1, Vol. 20, pt. II, p. 412, and O.R., 1, Vol. 20, pt. II, p. 415). The unit served in the Army of Tennessee, Department of East Tennessee, Western District of North Carolina (aka District of Western North Carolina), Department of Western Virginia, and its regiment was under Lt. Gen. Jubal "Old Jube" Early in the Army of the Valley during the Valley Campaigns of 1864. General Robert Ransom, Jr.: Graduated the United States Military Academy (West Point) in 1850. General Gabriel Colvin Wharton: Virginia Military Institute graduate-class of 1847. General Alfred Eugene Jackson: Unlike "Stonewall" Jackson, Alfred Jackson was nicknamed "Old Mudwall" Jackson. Prior to the war he was a farmer. On November 23, 1864, "Mudwall" was relieved of his command and served as a staff officer. He had Colonel William H. Thomas arrested and sought to court-martial him. General Edmund Kirby Smith: Commander of the Department of East Tennessee and Western North Carolina. He graduated West Point in 1845 and was strongly opposed to allowing Thomas' Legion the ability to operate as an independent command. General Simon Bolivar Buckner: Graduated West Point 1844, Mexican War veteran, resigned commission in 1855, businessman, and commander of Kentucky State Guard. Post-war: Governor of Kentucky, Vice-Presidential nominee in 1896. General James Green Martin: Native North Carolinian, graduated West Point in 1840, and Mexican-American War veteran. He was nicknamed "Old One Wing", because he lost his arm in the Mexican-American War. At the Battle of Churubusco in Mexico, his right arm was shattered by grapeshot and had to be amputated. Martin was credited for organizing the Old North State's military prior to the first shot of the Civil War. General John Crawford Vaughn: Native Tennessean and Mexican-American War veteran. General John Porter McCown: Graduated the United States Military Academy in 1840. General Daniel Smith Donelson: Native Tennessean, graduated West Point in 1825, and died of natural causes in April 1863. See O.R., I, 23, II, 621, O.R., I, 23, II, 787, and O.R., I, 23, II, 644. General John Stuart "Cerro Gordo" Williams. Lawyer, Mexican-American War, and politician. He received his nom de guerre for heroic actions during the Battle of Cerro Gordo. General Jubal Anderson "Ole Jube" Early: Graduated West Point in 1837 and was a veteran of the Mexican-American War. He was affectionately nicknamed "Old Jube." General Henry Heth: Graduated West Point in 1847. His division made first contact at Gettysburg. As an independent command, Thomas' Legion initially reported directly to Heth. General Robert Emmet Rodes: VMI graduate-class of 1848. He was killed on September 19, 1864, in the Battle of Opequon. General John C. Breckinridge: He was the fourteenth Vice President of the United States and a veteran of the Mexican-American War. In early 1865 General Breckinridge was appointed as Secretary of War in the Cabinet of the Confederate States of America. He held this post until the end of the war. John Breckinridge was also the cousin to Mary Todd Lincoln, the wife of President Lincoln. General William E. "Grumble" Jones: West Point-class of 1848, and classmate of Union General John Buford. General Jones was killed on 5 June 1864, during the Battle of Piedmont. General James Longstreet: West Point-class of 1842. As a major he fought in the Mexican-American War. General Robert E. Lee referred to Longstreet as his "Old War Horse." General Braxton Bragg: Native North Carolinian. Graduated West Point 1837, fought in the Seminole and Mexican Wars. He remains the most controversial Confederate general. He instructed Colonel Thomas to raise two additional Cherokee companies in November of 1863,. This allowed a total of 4 Cherokee companies which would become known as the Cherokee Battalion (O.R., 1, 49, pt. 2, p. 754). 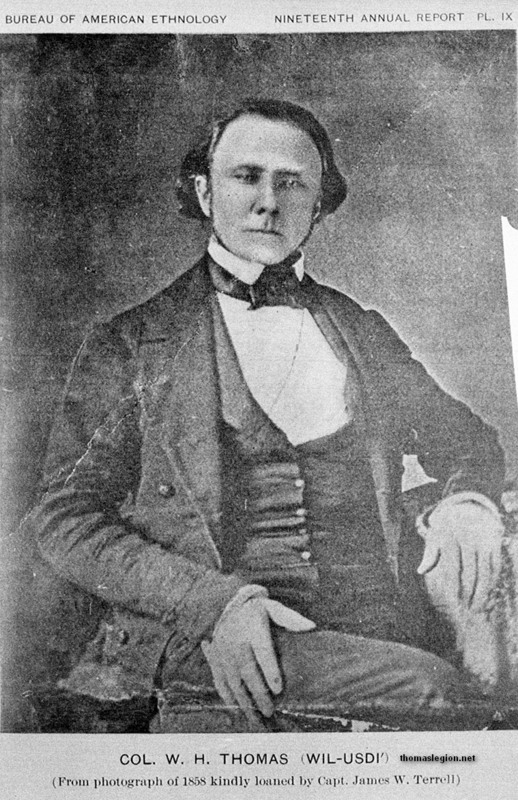 Senator William Holland Thomas, 1858, retouched. The 69th North Carolina Regiment was initially known as the "Highland Rangers" and 1st Regiment, Thomas’ Legion. 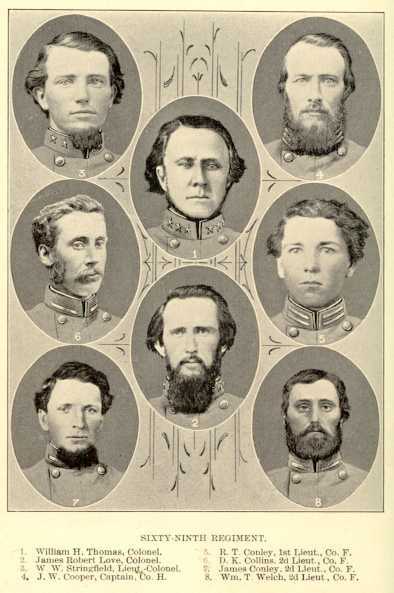 While there are 75 references to "Thomas' Legion" in the Official Records of the Union and Confederate Armies, the unit operated under various official and even unofficial designations. With these various designations came numerous responsibilities. Highland Rangers, Provost Guards, Provisional Force, Partisan Rangers, Home Guards, Love’s Regiment, 69th North Carolina Infantry Regiment, 69th North Carolina Regiment, McKamy's Battalion, Thomas' Legion Volunteers, 1st Battalion-Thomas' Legion, Walker's Battalion (80th Battalion), Walker's Regiment, Thomas’ Regiment-North Carolina, Thomas’ Regiment-North Carolina Volunteers, and 1st Regiment-Thomas’ Legion, Thomas' Legion of Indians and Highlanders, and Thomas' Legion of Indians and Mountaineers. The Cherokees of the Thomas Legion also operated under various unofficial designations: Junaluska Zouaves, Cherokee Battalion (O.R., 1, 49, pt. 2, p. 754), and Cherokee Companies. The sappers were also referred to as the “Pioneer Companies.” There was also John T. Levi's Light Artillery Battery, which was later referred to as Barr's Light Artillery Battery. Colonel Thomas even recruited 20 Cherokee Bodyguards, which he had on occasion called his Life Guard. The constant shifting of the unit's components makes a complete count of the Thomas Legion rather difficult. Although Companies A and L of the 16th North Carolina Infantry transferred to Thomas’ Legion, some of the legion’s companies were transferred to the 39th North Carolina Regiment and to various Tennessee cavalry regiments. Later, many companies were transferred back to the Thomas Legion. One count has Thomas’ Legion at 2,800, but it is doubtful that on any occasion the legion mustered more than "2,556." Its sappers had enlisted as masons, engineers, carpenters, black smiths and gun smiths, but when Brig. Gen. Alfred E. Jackson, aka "Old Mudwall," demanded that the Pioneer Company take up arms, it too promoted desertion. James W. Terrell would even write to Governor Zebulon Vance and state that the desertions were the direct result of General A. E. Jackson’s complete disregard and disrespect for the Thomas Legion's soldiers. February 22, 1864, North Carolina Division of Archives and History. Recommended Reading: North Carolina Troops, 1861-1865: A Roster (Volume XVI: Thomas's Legion) (Hardcover, 537 pages), North Carolina Office of Archives and History (2008). Description: The volume begins with an authoritative 246-page history of Thomas's Legion. The history, including Civil War battles and campaigns, is followed by a complete roster and service records of the field officers, staff, and troops that served in the legion. A thorough index completes the volume. Sources: Vernon H. Crow, Storm in the Mountains: Thomas' Confederate Legion of Cherokee Indians and Mountaineers;; Official Records of the Union and Confederate Armies; Walter Clark, Histories of the Several Regiments and Battalions from North Carolina in the Great War 1861-1865; National Archives and Records Administration; North Carolina Office of Archives and History; National Park Service: American Civil War; National Park Service: Soldiers and Sailors System; State Library of North Carolina; Moore's Roster; Weymouth T. Jordan and Louis H. Manarin, North Carolina Troops, 1861-1865; D. H. Hill, Confederate Military History Of North Carolina: North Carolina In The Civil War, 1861-1865; Christopher M. Watford, The Civil War in North Carolina: Soldiers' and Civilians' Letters and Diaries, 1861-1865. Volume 2: The Mountains; Library of Congress; North Carolina Museum of History; William F. Fox, Regimental Losses in the American Civil War; archives.gov; whitehouse.gov; bioguide.congress.gov; senate.gov.